Plus, Hapee Toothpaste CEO gives a glimpse of how they compete with the global brands dominating the local market. From having the biggest Hollywood stars as endorsers to being recommended by international magazines, Penshoppe and VMV Hypoallergenics have proven Filipino brands can compete in the global realm. With such successes, their early beginnings as small enterprises seem a lifetime ago especially when they are no longer exclusive to Filipino market with their strong global presence. But like all businesses, they were not spared by unforgiving challenges. They have pushed through some capital burns and store closings themselves, showing problems and trial spare no one. 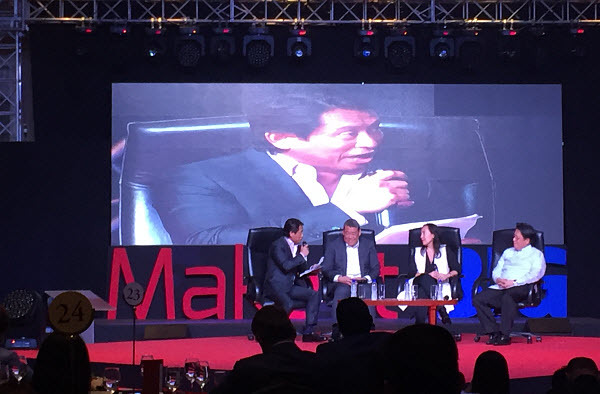 Golden ABC (Penshoppe’s mother company) CEO Bernie Liu; VMV Hypoallergenics CEO Laura Verallo de Bertotto; and Lamoiyan Corporation (Hapee Toothpaste maker) CEO Cecilio Pedro shared to hundreds of micro, small and medium enterprise (MSMe) owners their startup stories and how they remain relevant in the age of disruption, at the PLDT SME Nation Big Talks conference on Thursday, June 2. A decade ago, reaching new international markets meant building brick-and-mortar outlets, setting headquarters and shipping inventories abroad, paying dollars in the process. But the onset of e-commerce has helped entrepreneurs to do such without breaking the bank. “Any market we want to enter, we look at e-commerce first because it’s the most cost-efficient. There’s so much opportunity with technology today,” de Bertotto said. Marketing has become easier, thanks to analytics tools available online where every click or even mention in any social media platform can be measured the brand’s sales. Such change has given companies the chance to either grow or falter, depending how they cope with the times. “We have to embrace the digital age especially with the way we advertise. It’s different now and we have to resonate well with our audience,” Liu said. Penshoppe, meanwhile, hopes to become the most admired Asian fashion brand with aggressive marketing through its international endorsers like One Direction and world-renowned models, Gigi Hadid and Kendall Jenner. It is currently present in more than 10 countries, mostly in Asia. And if one has to resonate with the changing consumer habits, online presence is a must. If not, it has become a requirement for most enterprises to have a digital identity for better global coverage. “I personally feel all brands must have websites now especially with how easy they are made. If you stick to a Facebook page, I’d probably say that’s cute. But definitely a website makes it better,” de Bertotto added. VMV Hypoallergenics is currently present in 17 countries, reaching as far as Norway all the way to New Zealand. It also has its own branch in New York City, becoming a favorite of some Hollywood stars. The fast changing nature of the digital realm today could be overwhelming for some industries, but the executives believe having strong core values can make anyone stand still in the midst of disruption. “You have to be careful what change you will allow in your business. You have to have a certain compass on the line that you will cross,” Liu said. De Bertotto echoed the sentiment as core values could guide any brand to stay ahead of the pack with their distinct look and feel. But more importantly, the courage to move forward all begins in oneself, and for Pedro, who compete with giants like Colgate and Closeup, there is no bigger Goliath to defeat than the ones inside one’s head. “When we were starting, I had no experience in the toothpaste business, but I went on anyway. I constantly measure myself that I want to be better than yesterday. The leaders inspire growth in the company so I have to be constantly improving,” Pedro added. Elyssa Christine Lopez is Entrepreneur.com.ph’s editorial assistant/ staff writer. Follow her on Twitter @elyssalopz.